Photo © Island Club & Restaurant. Imagine a seaside hideaway, far from the madding crowd but close enough to merit a leisurely drive, perched up on a rock only 20 minutes outside of Athens. It sounds hard to believe but it’s actually true, just like the resplendent history of the place itself. Established by brothers Chrysanthos and Spyros Panas in 1994, Island Club & Restaurant was one of those crazy gambles no one thought would pan out. Developed on a dry cliff overlooking a sapphire bay, this luxurious oasis was built from the ground up, as nothing – not even the greenery – existed before the Panas brothers took over. The novel club-restaurant concept proved to be a huge success, mixing cocktails with sushi and an expertly curated wine cellar with a cigar vault, while the relatively isolated location on the edge of the Athens Riviera, allowed both the owners and the guests absolute freedom. 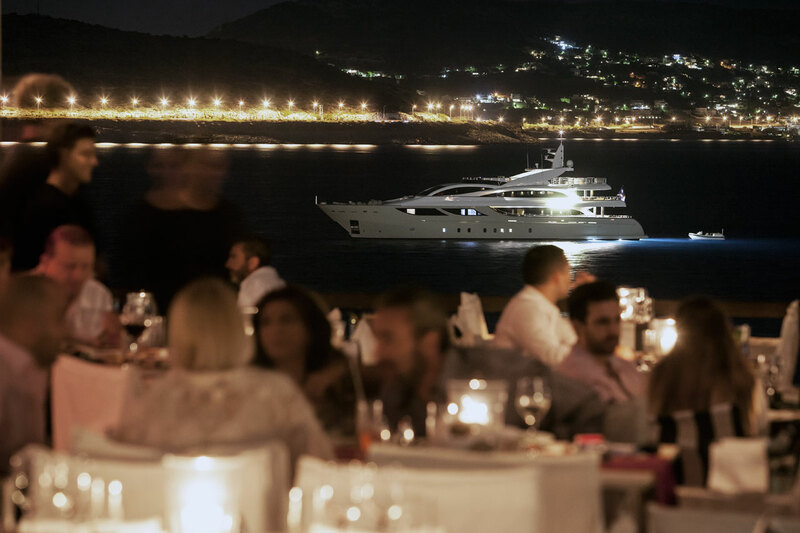 Their little slice of heaven turned out to have incredible staying power, still attracting jetsetters from every corner of the earth, who claim it rivals some of the best open-air nightclubs in Saint Tropez and Monte Carlo. The Club & Restaurant. Photo © Island Club & Restaurant. The Private House. Photo © Island Club & Restaurant. Riffing on the Cycladic islands, the architecture is white, crisp and sun-drenched, while the sprawling grounds combine a little bit of everything: a dance floor, a cocktail bar, a dining area, a pool, a private beach, a diving platform and even a stunning chapel for exclusive weddings. In 2004, the owners added a private house to the mix, whose first official resident was none other than Microsoft tycoon Paul Allen. Since then, a slew of celebrities have stayed on the premises, including Valentino, Meryl Streep, Tommy Hilfiger, Hugh Jackman, Bruce Willis and Prince Albert of Monaco, among others, while Ethan Hawke fell head over heels for the breezy camping grounds, Island’s best kept secret. The spectacular view of the sunset - best enjoyed with an exotic cocktail in hand - will keep you coming back for more, long after the summer has come and gone. Paradise awaits!